When it comes to action-packed games of pure excitement and anticipation, the Skulls of Legend video pokie appears to be the candidate for a game of the year. You might think that we are exaggerating, but once you hit that spin button yourself, you will know what we’re talking about. iSoftBet is taking huge strides to gaming stardom, rushing forward in giant leaps thanks to impressive games such as this one in their portfolio. Five reels, 30 paylines and 4 different Bonus features with an impressive amount of free spins speak for themselves in this game that can reward you with up to 45,000 coins. Do have a try and then come back to tell us if you shared our enthusiasm over this title. We love everything about this game, it is as simple as that. The idea of creating a pirate theme, that ever-lasting subject that has gone through massive exploitation in pop culture and entertainment industry in the new millennium in particular, has got a worthy representative in the gaming business as well. The emerging and highly exciting developers called iSoftBet have done their homework prior to creating a pirate theme by putting all of the pieces together, leaving nothing to chance. Starting from the top, you will be highly impressed with the detail level that has been put in the graphical aspect of the game. 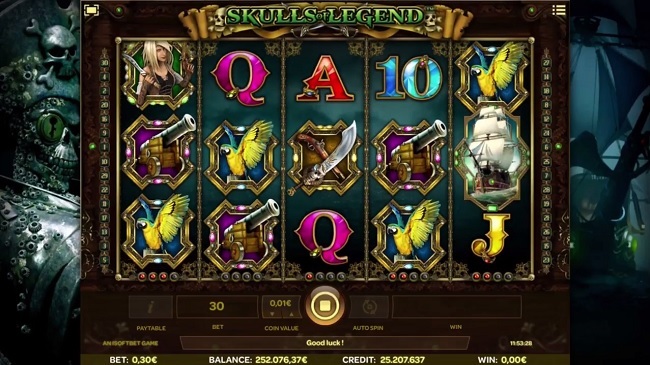 Even though it is a dimly lit game, such as a pirate theme should be, the Skulls of Legend video pokie offers great visual details that are most visible with popping animated snippets during the Free Rounds. Rum barrel rolling on the bottom of your reels or a compass spinning around, and even a pirate shooting his gun towards the symbols are impressive little details that are bound to keep you thoroughly engaged and excited. Features to this highly rewarding game are the story of their own. The game benefits from a four-mode Free Spin feature which offers 7, 10, 14 and 15 free games respectively, together with sticky wilds, rearranging symbols and disappearing ones as well all for a possible reward of 45,000 coins. Even the base game is quite rewarding with the Extended Sticky Wild feature which will leave your entire reel covered in Wild Scull for the duration of 4 spins, thus improving your winning chances more than significantly. Call us biased or blindfolded, but we fail to notice any shortcomings to this brilliant game. Of course, not all of us like the pirate theme, but even those of you who despised Johnny Depp for his role in the Pirates of the Caribbean will find it hard to remain immune to action-packed and highly rewarding Skulls of Legend game. In one word – definitely. Another great aspect to this game that is bound to draw you aboard is the game’s affordability. Being available for not more than $6, the Skulls of Legend video game is the one that will suit all sorts of player, whether they are beginners, casual gamers or high rollers. There is plenty to play with and plenty to play for in this exciting high sea journey upon a proper pirate ship.